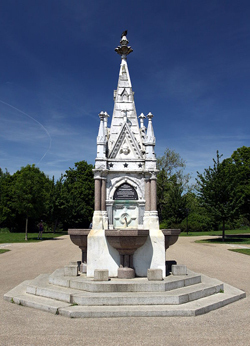 This gothic drinking fountain located in the centre of the Broad Walk in The Regent’s Park takes its name from Sir Cowasjee Jehangir, whose nickname, thanks to his business success, was ‘Readymoney’. A wealthy industrialist from Bombay, Sir Cowasjee donated the four-sided fountain to the park in 1869 as a thank-you for the protection he and fellow Parsees received from British rule in India (hence why the fountain is also sometimes called the Parsee Fountain). Made from 10 tonnes of Sicilian marble and four tonnes of red Aberdeen granite, it was designed by Robert Keirle – architect to The Metropolitan Free Drinking Fountain and Cattle Trough Association – and made by sculptor Henry Ross (at a cost of £1,400). Set on an octagonal stepped base, it features a basin on each of the four sides. Decorative elements above the basins include carved marble panels featuring a lion and a Brahmin bull. Three of the gables feature a small bust – one of Queen Victoria, another of Prince Albert and another of Readymoney himself. The fourth has a clock instead. 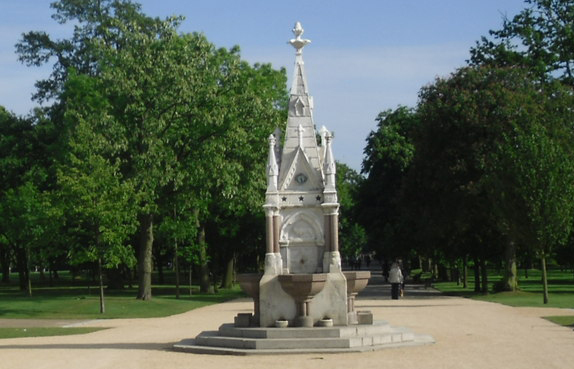 The now Grade II-listed fountain was erected by the Metropolitan Drinking Fountain and Cattle Trough Association and unveiled by Princess Mary of Teck (later Queen Mary, wife of King Edward VII) on 1st August, 1869 (she also has some gardens in the park named after her). The fountain was restored in 1999-2000 and again in 2016-17. The water no longer flows but it remains as a memorial to Sir Cowasjee’s story. PICTURES: Top – Peter Smyly (licensed under CC BY-SA 2.0); Right – Chmee2 (licensed under CC BY-SA 3.0) Images cropped.